I’m so sick of drawing them in their formal wear. :*( Ah well. Thanks for reading every one! Oh, and I got a Tegaki E. It’s addictive. Poor Mimir, No info on Security for her/it. As always LOVE the comic! The “her/it” was referring to Mímir. Nuts, missed the first comment for the first time in a bit. Ooh, no info on Security. Raise your hand if this surprises you! *looks around* No hands. Gooood. Sorry, comment made late at night. Awesome page, I love his reaction when Mimir has no information. Can’t help but wonder if you were going for “Zephyr” with your username. I read through all the archives. Security now has an arch enemy, after a fashion. Hnaef really doesn’t handle mystery well, huh? Nice work with the simple backgrounds on this one. They convey the moods excellently, Liliy. *Laughs. * Well, given that he never told Mordred that the magic sword he was looking for would first hide from him, then burn him, then insult him, I think Hnaef is getting his due here. Arthur would not accept that as an excuse if he found out Hnaef had set out to humiliate the youngest Garrott. *Nods. * This has to be a comeuppance for Hnaef. But he just gave Security free info. *Laughing* Hnaef’s psyche has snapped over the unacceptable, preposterous and incomprehensible notion that there could be something or someone beyond the reach of his database. He’s stumped by the sheer sly maneuvering of Security. :lol2: has anyone noticed that we are seeing mr.garrot’s face for the first time? More seriously, can anybody imagine what it must be like for poor Hnæf? He knows everything in the world, EVERYTHING, except the information on this man. What a great face! Your style of art is so charming, and fits the mood of the story perfectly! Mimir eh? Norse God guardian of the Well of Wisdom? Seems suitable, and once more displays your love for mythology. I approve. :lol2: The world has has ended for Hnæf. D: Ah, the random appearing Security strikes again. . .
On a other note. . . I :love: love all your characters. Such sweet children. . .
Liliy , is security going to be evil later, the sword burned her so that would mean shes not good like wiglaf…or is she just so neutral it didnt know? Uh, I think Security is male. err it is a she right? Is that revenge for kicking the airplane seat? XD Oh dear, someone’s not happy… I wonder what Hnaef’ll do now? no data from mimir is like saying “you just got asked a question from a ghost.” creepy, as well as frustrating. It’s rather nice coming back and looking through the archives once in a while. 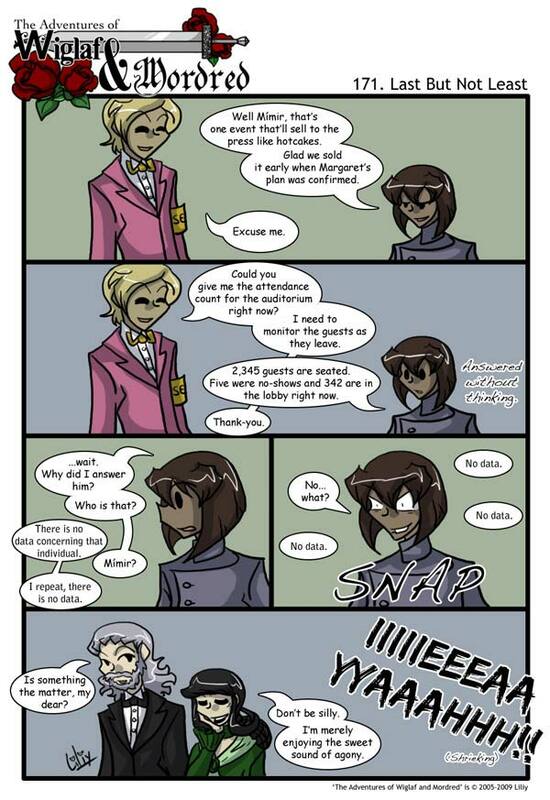 I love how you drew Hnaef in the fourth panel!